Commercial / Industrial Services - Thornton Iron & Metal, Inc. provides a convenient pickup service for companies that generate scrap metal. Our professional and reliable service is our strength. Our pick up services includes: Tractor trailers, roll-off trucks with 10-, 20-, 30-, or 40-yard roll-off containers, flatbed trailers, open-top trailers, box vans, etc. We also offer boxes, pallets and small containers. 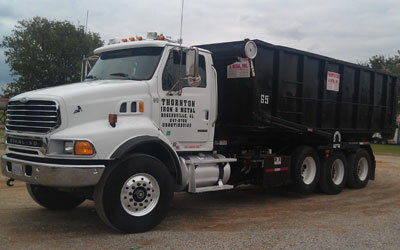 Demolition Services - Thornton Iron & Metal, Inc. also provides demolition services throughout the United States. No job is too large for our professional staff to handle. We have performed demolition jobs around the country and can provide a list of references. Please contact Mike Thornton at 256-247-0708 or email mthornton@thorntonim.com for more information. 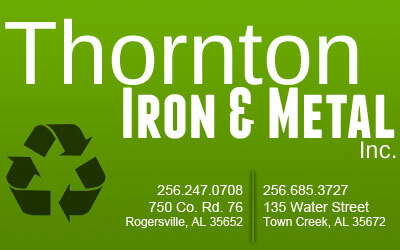 Brokerage Services - Thornton Iron & Metal, Inc. offers mill direct brokerage services for customers with larger volumes of recyclables. Please ask for details on this domestic and international program.